BEAVERTON — Madeline Foutch loved everything about her school — the students, the teachers, the family-like community. But there was one thing missing. 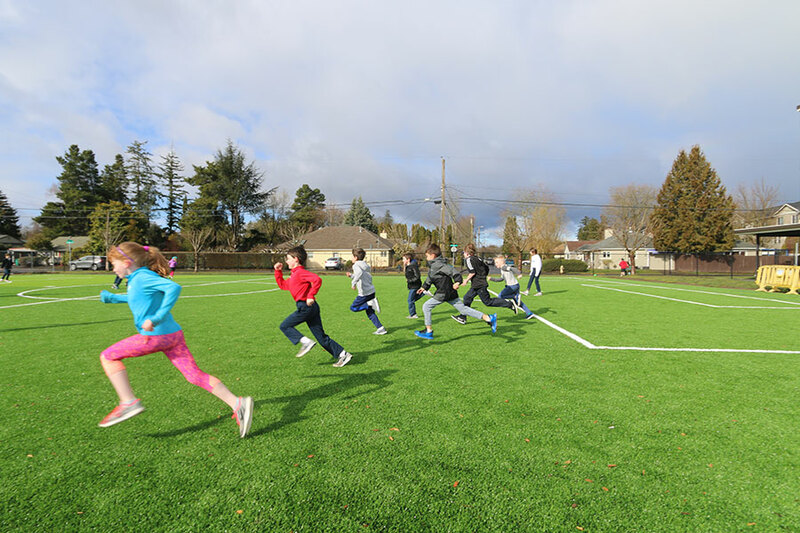 “I thought it would be great to have a track and field, a place to run and play outside with classmates,” said Madeline, a seventh grader. So three years ago the spunky student came up with a plan. 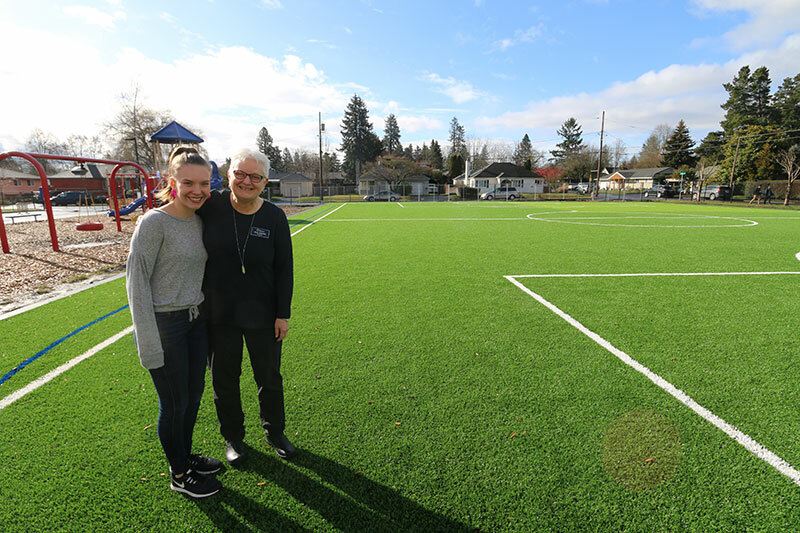 With help from her parents, Madeline created a slideshow about the benefits of a turf field and presented it to St. Cecilia Principal Sue Harris. “It showed how staying fit can help keep students’ minds clear and then they can learn better,” Madeline said. Fast-forward three years. 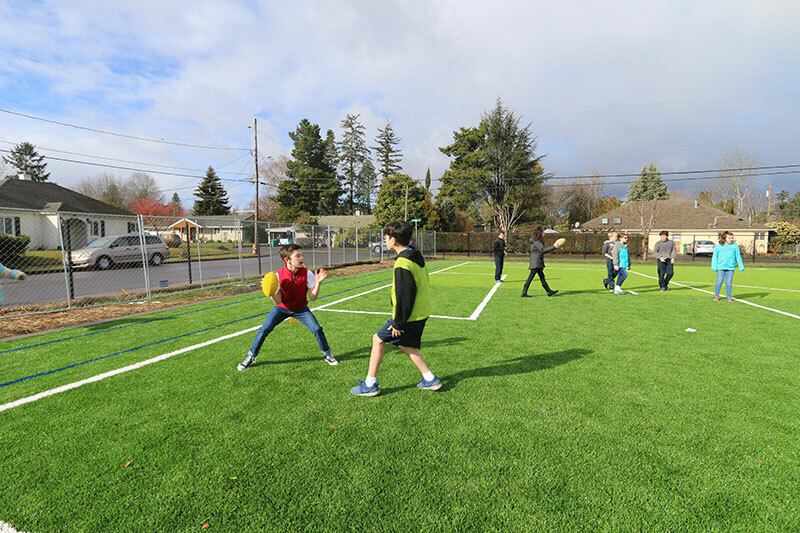 Madeline is standing on a brand-new turf field as clusters of students zigzag across the green expanse. One group is tossing a football, another kicking a soccer ball. A few youths dart around aimlessly emitting gleeful hollers in the spring sunshine. Finished in February, the new turf is soft for falls and drains easily. More than $75,000 was raised for the project, with the total including matching funds from Nike via school parents employed by the company. A portion came out of the school’s endowment, and Father Cary Reniva, pastor of St. Cecilia, and parishioners lent their support. St. Cecilia parent Mike Smyth is a landscape architect who helped design the field. Flying H Construction, owned by a St. Cecilia family, donated labor. 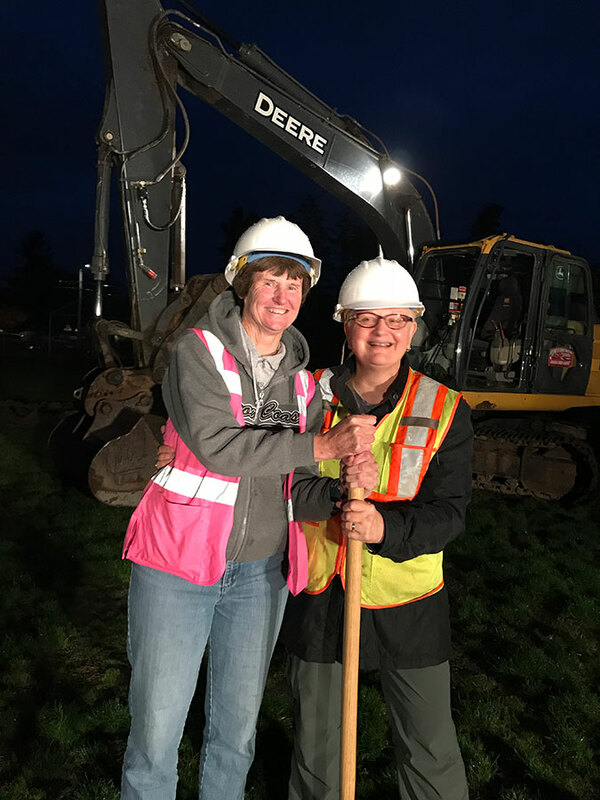 In a sense, the project is a tribute to two longtime friends and colleagues — both nearly synonymous with St. Cecilia School. Harris and Kathy Budnick, the health and PE teacher, have known each other since they were students at La Salle Prep. Harris has been principal for 21 years; Budnick has been at the school for 31. Humor and banter regularly make an appearance in the Budnick-Harris friendship. The space will be put to good use under its namesake. 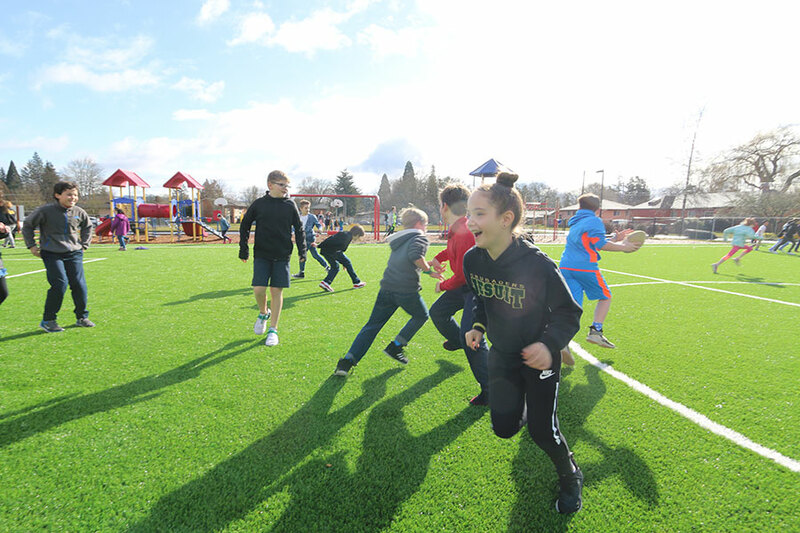 During PE, students “run laps, play soccer, play kickball,” said Budnick. 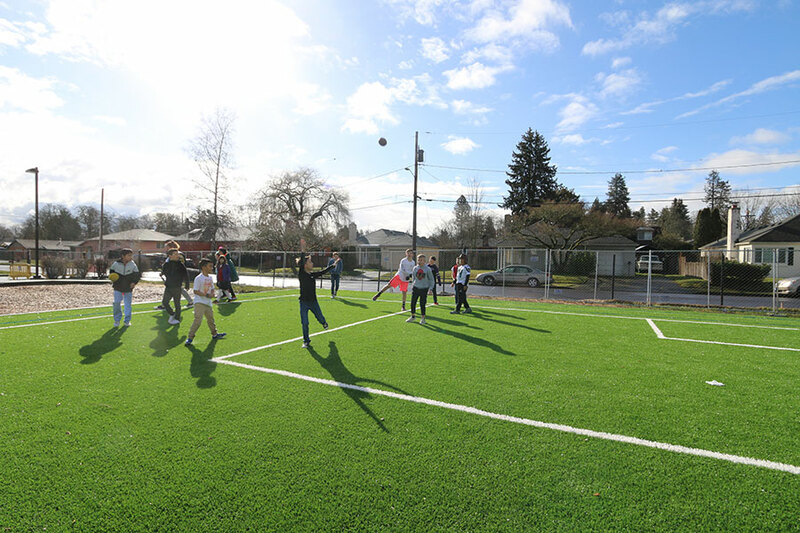 Harris believes the field enriches not only the school but also the parish and wider Beaverton community. “Families can come and play with their kids after Mass,” she said. Madeline, watching younger students play on the turf, said she’s excited the space will delight kids for years to come. “It’s a really good feeling to see this dream come true,” she said.